Israeli forces continue searches for terrorist responsible for Sunday's attacks. IDF lays groundwork for demolition of terrorist's home. Overnight, Israeli security forces including IDF troops, Shin Bet internal security agents, Border Police officers and Israeli Police forces operated in villages in the Qalqilya district of western Samaria, as part of the ongoing pursuit of the terrorist who carried out a pair of terror attacks Sunday morning, an IDF spokesperson said Monday morning. The attacks Sunday left one IDF soldier, 19-year-old Gal Keidan, dead, and two other Israelis wounded, including 47-year-old Rabbi Ahiad Ettinger, a father of 12 from the town of Eli. Both Ettinger and a second IDF soldier were shot and wounded by the terrorist, and are in serious condition. Gal Keidan was stabbed after the terrorist snuck up on him from an illegal Palestinian Arab shop near Ariel Junction. The terrorist then stole Keidan’s firearm and shot him. 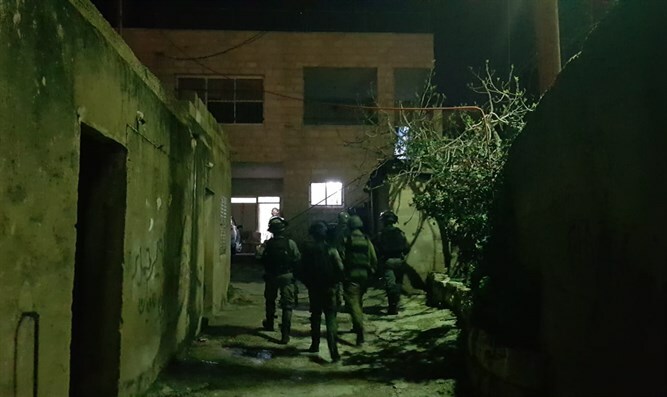 During the operation overnight, IDF troops surveyed the terrorist's house in order to examine the possibility of its demolition. In addition, the troops conducted extensive searches and carried out security checks at the entrances and exits of the villages. In addition, overnight, two pipe bombs were hurled at IDF troops who operated near the City of Jenin. No injuries or damage were reported.